The Tower of Refuge sits on a low slung rock called Conister, or St Mary's Rock. 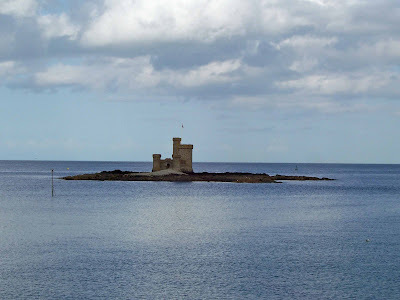 At high tide, the rock is invisible, and before the tower was built, posed a serious threat to ships as they made their way into Douglas Harbour from the North East. The tower was built in 1832, and had no military significance. Instead it was placed on the low lying rocks as a way of warning sea borne traffic of the hidden rocks at high tide. Built at a cost of around £255, the tower was designed by John Welch, and consists of three towers linked together to form a triangular structure, with a single tall square tower behind it. The tower's purpose is to provide a safe haven in the event of a wrecking. It is now in the hands of the RNLI, whos flag flies from the tower.